Dr. Bill Bradley, 36 pages. The Truth that the King James Bible is the Preserved Word of God - Plain teaching by Dr. Mickey Carter, Pastor of Landmark Baptist Church, on this vital subject. A printed version of a college chapel series preached by Dr. Bill Bradley at Landmark Baptist College. Sections: What is the rapture? What is the definition of the pre-tribulation rapture? What is the tribulation period? What are some Old Testament references to the tribulation period? What is the purpose of the tribulation period? Matthew chapter twenty-four is about Israel; it is not about the church nor is it about the church age saints. Pre-tribulation rapture teaching in the Scriptures. The "Lord's Prayer" is a pre-trib rapture prayer. Printed by our friends at Victory Baptist Press, this newest book was taken from class notes taught by Pastor Carter at Landmark Baptist College. Transcribed by Thomas J. Kane. The book of Daniel is an exciting book for our time. Many current events were predicted in the book of Daniel long ago. Daniel is about the battle of the gods—the true God, Jehovah, vs. the pagan gods. This battle continues today; Americans are trying to adopt all the false gods of the world and put them on the shelf with Jesus. This conflict will continue until Jesus returns and takes command, and He will do just that. For nearly five decades members of Landmark Baptist church have enjoyed the great stories Dr. Carter has told from the pulpit. These stories tell of insurmountable circumstances and how the Lord showed His hand and answered prayer. Sometimes these stories are humorous but always thought provoking. God is real and has shown Himself real over and over again. This is the testimony of Pastor Mickey Carter, a race car driver who found the Lord and a brand new purpose in life. The exciting testimony of a pastor who has been used of God for more than 50 years and has pastored the Landmark Baptist Church of Haines City since 1971. This classic little book is a series of five lectures tracing the lineage of Bible-believing Christians, beginning with the time of Christ and following them through the early twentieth century. Though called by many names, these all shared their undying devotion to the fundamental doctrines of Scripture. This devotion led to unthinkable suffering and cruelty from the hands of a religious crowd who did not share their convictions. 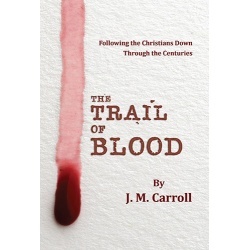 There are touching stories of martyr blood splattered throughout church history, but one look at the fold-out chart at the end of the book clearly shows the literal bloodstream of our Baptist ancestors. This book focuses on the path to holiness and the relationship with Christ that allows us to become pure and clean and blameless before God -- to be holy. May that become the fervent desire of your heart through these studies on holiness. In The Faithful Baptist Witness, Dr. Stringer deals not only with Baptist heritage and history but also with Baptist distinctives and doctrine. This is a book written by a man who, after a number of disturbing experiences in the military, suffered from PTSD and a survivor's guilt. In 1993 he became a born-again Christian. He received the help and peace he had desired. After years of prayer and study, Dr. Doug Carragher authored this book with a desire to share what he has learned with those who are still searching.